This page relates to the problem of constructing a good stereo pair from imperfect source images, using Panorama Tools. If allowed to optimize roll for both images, then rms 0.43 pixels with maximum vertical disparity = 0.96, but roll = 15 degrees. In this case, much better results are achieved by locking the projection parameters for one image, and accepting a small amount of vertical disparity in the resulting fit. What went wrong with the original shots? Hard to say. 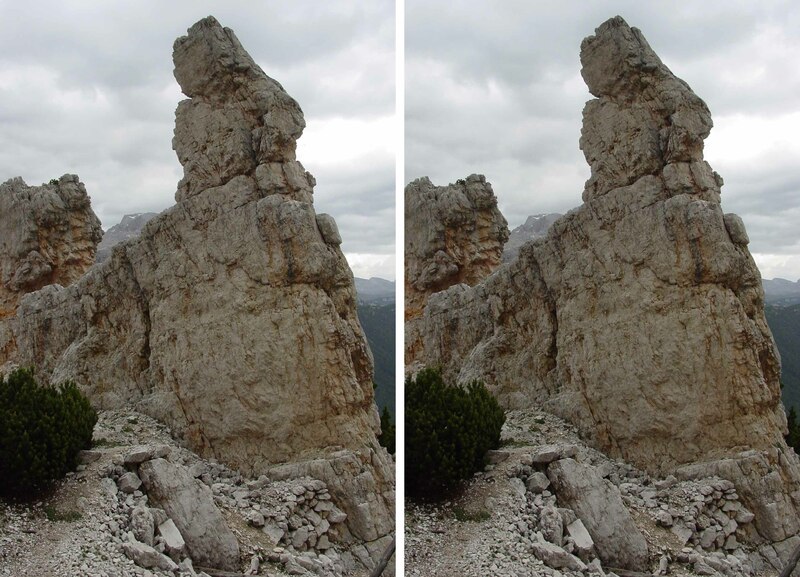 Looking closely at alignment between the rock and the background mountain, it seems clear that the camera was a bit lower for the left-eye image than for the right. This tilts the camera-camera axis and may be responsible for the roll in "best fit". However all the errors are pretty small, and the system is sensitive to any remaining barrel distortion -- changing b from -0.020 to 0 changes the "best fit" roll from +15 degrees to -7 degrees. doubt that one could see any difference in the final result. Page last modified July 29, 2004.